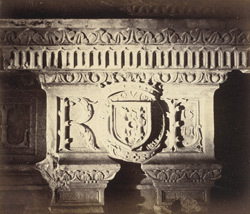 View of an alabaster chimney-piece at Kenilworth Castle in Warwickshire. Kenilworth is the largest castle ruin in England and was one of the country’s most magnificent residences. The chimney-piece crowns a fireplace on the ground floor of the Elizabethan gatehouse built by Robert Dudley, the Earl of Leicester, as the main entrance to the castle on the north side. His initials “R L” and the date 1571 are carved upon it. Reverend Knowles notes “The famous fireplace, (about 1570), the chimney piece of which is made up of a fine alabaster one, brought probably from the Privy Chamber”. He also quotes from a c.17th-century manuscript valuation of the castle which lists: “A Chimney pece…of Allablaster curiouslie wrought in ye privy chamber”. Leicester was a favourite of Queen Elizabeth I and was given the castle by her in 1563. In addition to the gatehouse he built a Tudor pleasure garden, and a range of lodgings for distinguished guests known as Leicester’s Building, transforming the medieval structure into an Elizabethan palace. The castle was the setting for a celebrated royal visit in 1575, when the Queen was entertained in spectacular fashion for 19 days.